Our posters were amazing and Make Signs even found an error for us and uploading the corrected file process could not have been easier. Fantastic customer service, quality of final product, and timeliness! Definitely will be my go to place for future posters! Thank you! Came super fast and looks great. The colors are just what I thought they would be and the graphics/pictures I had were crisp and clear. MakeSigns was fantastic! I was able to get my poster printed and shipped within 1 day without problems. 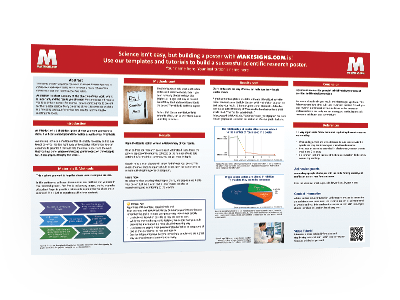 The poster looked perfect and everyone at the conference was impressed with the overall quality of the presentation. One the reps reached out to me because I ordered a plastic tube and a strap. She informed me that the tube came with a strap and inquired if I wanted to remove the extra item. I appreciated her catching that instead of charging me for the same item twice. 5 stars; will highly recommend to fellow medical students. Make Signs continues to be one of my favorite companies to do business with. We ordered 15 posters printed and with "regular" shipping, they arrived in 1 week. The process of ordering, approving the proofs, etc. all worked without a hitch and the quality of the finished products were just as we have come to expect perfect. All that and you remain slightly less expensive than using a local printer! MakeSigns has become my go-to site for all scientific posters. Quality is outstanding, service is quick and relatively inexpensive. The poster looked amazing! Very satisfied with the quality! good quality poster, as expected. Print Media is high quality. Ink is perfect. No smudges or ink runs on the poster board. Poster arrived exactly in the condition it was expected to be. My poster looked amazing and shipped quickly, saving my bacon during a tumultuous month. Amazing service as always. Appreciate fast turn around time and beautiful printing! The final product was excellent and the customer service superb!